After a storm, many think the dangers have left with the high winds, heavy rain and lightning strikes; but sometimes danger can come during the storm recovery period. Keeping your distance from downed power lines, and knowing what to do if you see one, are the first steps when recovering from a storm safely. If you see a downed power line, which could be making contact with tree limbs, vehicles and puddles, always stay clear about 30 feet. There is no way of knowing whether or not the power line is still live, and if you happen to touch one that is, consequences could be deadly. If you see that someone already made contact with a power line, do not try to rescue him/her. You can’t help if you become a victim. Immediatley call 911 for assistance, and then contact your local electric utility to turn off the power. If you must exit the vehicle for life-threatening reasons — jump out and away from it, making sure to land with your feet together and touching. Then, shuffle away with your feet touching until you reach a safe distance. NEVER attempt to get back into a vehicle that is in contact with a power line. Indiana Electric Cooperatives stresses the importance of staying safe around electricity and downed power lines after a storm passes through. It could save a life. Wear proper safety material: As you are cleaning up, make sure you are wearing proper protection to prevent injury. Work gloves, safety glasses, heavy-duty work shirt with long sleeves, work pants, and steel-toe work boots are a good idea if you are working on clearing large amounts of broken, splintered, or sharp debris. 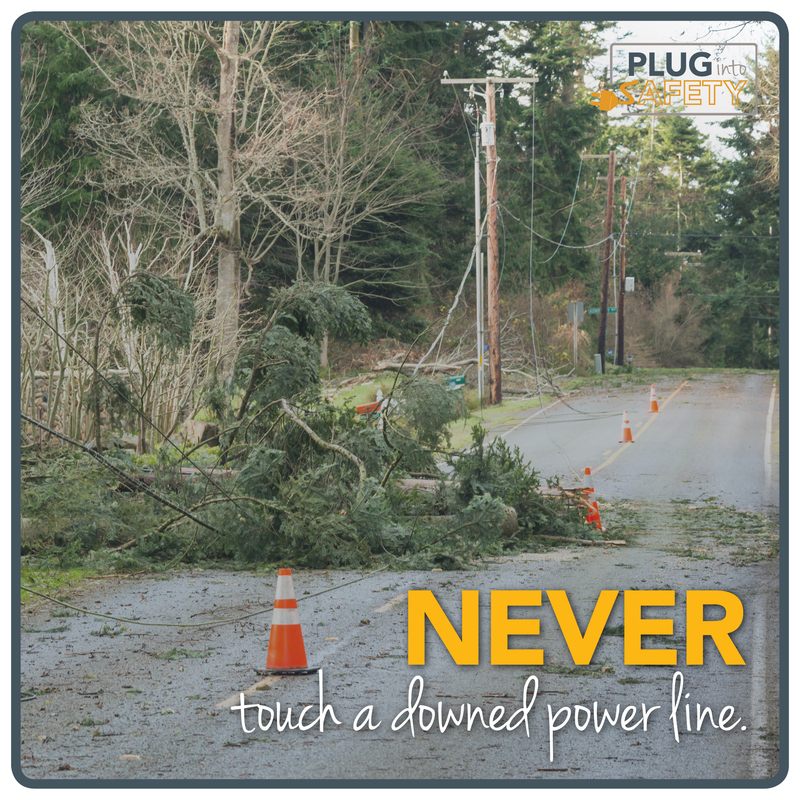 Stay away from power lines: Always assume a downed power line is live. Downed power lines pose a particularly dangerous threat in areas where there are lots of people trying to clear fallen trees and branches from roads and lawns. Let the professionals handle this job. It's not worth the risk. If you see a downed power line that is sparking or on fire, call your local power company immediately. Use flashlights, not candles: When checking for damage to a home, never use matches, candles, lighters or kerosene lanterns as a light source. Igniting a flame while near damaged gas lines can cause an explosion. Do not touch the vehicle and the ground at the same time with any part of your body or clothing. Open the door to your vehicle without touching the metal door frame. Jump out of the vehicle with both feet together and so both feet land at the same time. Shuffle away so that the toe of one foot shuffles forward along the length of the other foot, ensuring that both feet are in constant contact and always touching the ground.